1. If you haven’t cooked your kamut, begin by doing so. In a medium pot, add kamut and 2x the amount of water/stock. Bring to a boil, cover, decrease heat and simmer for 30-60 minutes, until cooked through. Once finished, drain any leftover water and set aside. 2. Meanwhile, preheat oven to 400F. 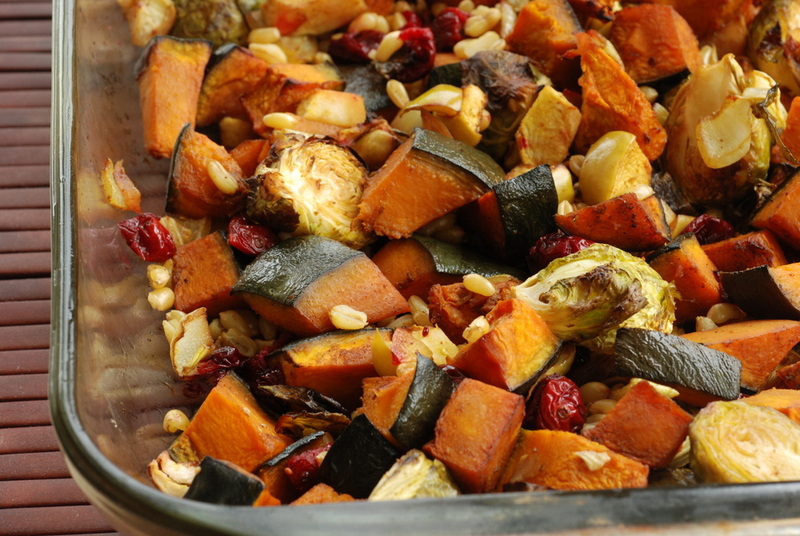 On a large silpat-lined baking sheet, place the chopped Brussels sprouts, squash, cranberries, apple and onions. In a small cup, combine the oil, vinegar and curry powder. Pour dressing overtop vegetables and stir to evenly coat the vegetables. Season with salt and pepper, and add sugar if you like. 3. Bake vegetables uncovered for 20 minutes, stir and roast for an additional 20-25 minutes, until soft and browned. Serves 3 as a main, 8 as a side. Nothing beats roasted veggies in the winter eh? I am eating them multiple times a day! I love kamut! This looks gorgeous – I love all the colors, and curry with brussels and squash is such a great combo. 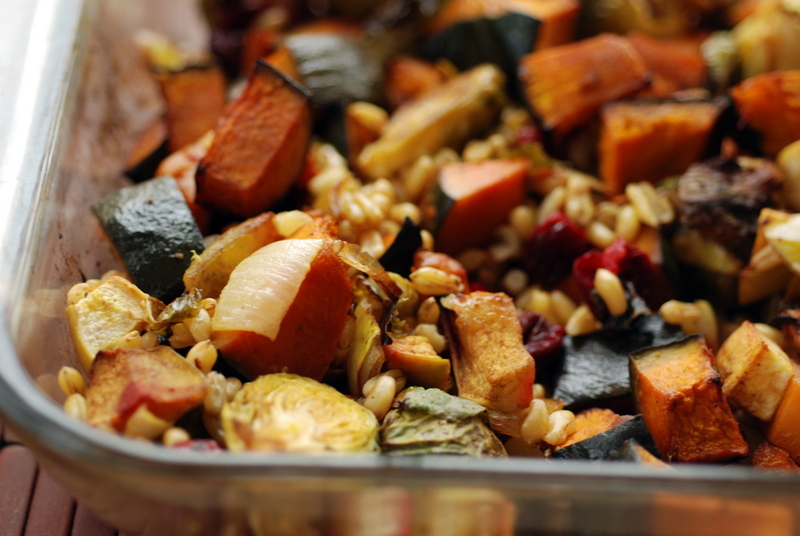 Your roasted veggies with KAMUT® Brand khorasan wheat is described so well, I can almost smell it and I am now hungry! This would be a great savory side for my family’sThanksgiving dinner. I work for Kamut International, the KAMUT(R) brand owner. KAMUT® Brand khorasan is an organic, non-genetically modified, ancient wheat variety similar to durum. In 1990, “KAMUT” was registered as a trademark by the Quinn family in order to support organic farming and preserve the ancient khorsasan wheat variety. Under the KAMUT® Brand name, khorasan wheat must always be grown organically, never be hybridized or modified, and contain high levels of purity and nutrition. Today, Kamut International owns and has registered the KAMUT® trademark in over 40 countries, and is responsible for protection and marketing of all KAMUT® Brand khorasan wheat throughout the world. KAMUT® Brand khorasan is grown on dryland certified organic farms primarily in Montana, Alberta, and Saskatchewan. The grain is prized by consumers who appreciate the grain for its high energy nutrition, easy digestibility, nutty/buttery taste, and firm texture. KAMUT® khorasan wheat is higher in protein, selenium, amino acids, and Vitamin E than most modern wheat and contains essential minerals such as magnesium and zinc. It is used as whole grain berries, whole grain flour, white flour, flakes, and puffs to make a variety of products. Some specific benefits of using KAMUT® khorasan are receiving more nutrients, protein, and taste than conventional whole wheat – plus supporting organic agriculture and helping to preserve an ancient grain. KAMUT® Brand khorasan is a variety of wheat thus has gluten content. A lot of people who are not able to tolerate wheat tell us that they are able to tolerate KAMUT® khorasan wheat. KI has ongoing research to understand why – it is our theory that because KAMUT® khorasan is an ancient grain, it has not had the good benefits bred out of it, as modern wheat has. We have a searchable database (Products tab) on our website http://www.kamut.com that can help you find the grain in Toronto. There are several fine online retailers as well as health food stores that carry the whole grain KAMUT® Brand wheat berries. Thanks for the info, Jamie. There must be more retailers with kamut because the store I bought mine in Calgary is not listed. Plus, the list is fairly short! Janet – The list is not exhaustive; it includes those customers that are partners via our license agreement. They support the KAMUT(r) project, so we like to support them. Please spread the word, we would love to have additional retail outlets listed. I wonder if I can find kamut at Whole Foods…hmm. It sounds like something I would love! Though, I know for sure I would love those roasted veggies so perhaps I’ll just pair them with wheatberries in the meantime. Whole Foods stores often have KAMUT® Brand khorasan wheat in the bulk bins. And Bob’s Red Mill, among others, packages the whole grain berries along with flakes and flour. Hey Hannah, Yes, please let me know how your hunt goes… I remember having a hard time just tracking down spelt berries nevermind kamut. I feel like Ambrosia should have it but I haven’t been there in a while. If you are mobile, it is my favourite whole foods store although it is in Thornhill! Essence of Life is also a great place to check out.. haven’t been there in a while myself. I should try to hit them up before the snow stops me from biking! What an interesting combinations of ingredients: kamut, curry, and balsamic vinegar. I’d never have thought of that. Thanks! I can’t say I’ve done balsamic and curry together but it must be amazing because I know I love both! This combination of ingredients sounds amazing for Fall – roasted veggies, fruits, sweet, tart, and spicy flavours all in one! I would probably just eat it on its own but the kamut is a good idea for making it more of a main dish. The only way I’ve tried kamut is in PC’s 5-grain blend (http://www.presidentschoice.ca/LCLOnline/products.jsp?type=details&catIds=cat40002&catIds=104&productId=prod1730005&amp😉 – not exactly the real thing, but I like it for a quick dinner mixed with whatever I have in my fridge when I don’t have anything else planned! I must have walked by that kamut a hundred times and never thought to buy some to try. If you ever need to replenish your stock, just let me know 🙂 This sounds like a great combination of vegetables and I’m really intrigued by the balsamic curry mix, those are two ingredients I would never have thought to mix. I wonder if it is a western Canada thing… 😉 If you try it, please let me know what you think. I love the sound of this dish. I’ve never been able to find any kamut locally, either…but I’m thinking that I could substitute my favorite grain, farro pretty successfully. Again, this looks and sounds fantastic! Farro sounds like a splendid substitute! You don’t even need to add anything to the veggies and just eat it as a side.